Happy Cinco de Mayo! But before you start knocking back mojitos, shift your thoughts from Mexico to Westeros, where at the end of the first GOT book, "the night came alive with the music of dragons." What does the music of dragons sound like? 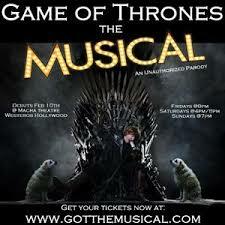 No idea, but I'm going to hear it for myself and so are you - because we're both going to "Game of Thrones: The Musical" at San Diego Comic-Con. When: Thursday, 20 July - Sunday, 23 July. There will be 8 shows: at 6 and 9 pm Thursday, Friday and Saturday, a bonus show Friday at midnight and a Sunday matinee at 1 pm. So you'll be able to fit this into your schedule somehow - and if you didn't get a Friday or Saturday badge, this could be a great way to spend one of those days. What's It Going to Be Like: Not a faithful rendition of the show/books set to music, but an opportunity to "relive the most iconic moments from their favorite show - this time as an absurd, laugh out loud musical comedy." Apparently the musical will extract all the laughs that were just hiding all this time inside the decapitations, smoke births and wedding massacres. Why You Want to Go: Besides the obvious chance to hear a dragon symphony, you'll be helping the founders support The Wayne Foundation, a charity that promotes awareness about sexually exploited children. 5 percent of all ticket sales will go to that worthy cause. AND the creators are the same people behind Lost: The Musical and Once Upon a Time: The Rock Opera, which you may also have seen at SDCC. If you liked those shows, you'll obviously like the 12 original songs featured in this show. And finally, you'll have bragging rights to make your friends jealous, which we all know is one of the top benefits of Comic-Con. You can get your tickets here. Don't wait too long to book your own iron throne.